There are simple ways you can support an aging loved one you know and help seniors enjoy the holidays a little more this year. For most, the holidays bring feelings of joy, anticipation and excitement. Spending time with friends and family, attending holiday gatherings and exchanging gifts all symbolize the season of goodwill. However, not all people experience happiness during the holiday season. Close to 12 million seniors live alone. And many often struggle with grief over the loss of a loved one, sadness, confusion and isolation, especially if they don’t have family close by. This can bring on the holiday blues and make it difficult for seniors to enjoy this time of year. Let’s help seniors enjoy the holidays! Whether it’s an aging parent, friend or neighbor, there are simple ways you can help seniors enjoy the holiday a little more this year. Be a companion. Make it a point to visit and spend time with a senior loved one. Participate in an activity they love, play their favorite game or simply ask them about their life. Storytelling and memory sharing is a great way to lift a senior’s spirit and can be very important to the aging process. Let your elderly loved one share stories and explore memories by looking at old pictures, letters and newspaper articles and by listening to music. Remember to also be thoughtful. If your loved one has experienced memory loss, it can be difficult and frustrating when you are telling stories or recalling events from the past. You also can help set up Skype or Facetime so that they can visit with out-of-town family members and friends. Our Companion Care Services can assist those who may not have family nearby and help seniors enjoy the holidays a little more. Be a chef. Prepare one of their favorite holiday meals and then stay to visit and enjoy the meal with them. This can be a great way to connect with your loved one. Also, consider inviting them to cook with you and have fun making a favorite family holiday recipe together. Check out these holiday recipe ideas for inspiration on creating new holiday food traditions. Be a home helper. 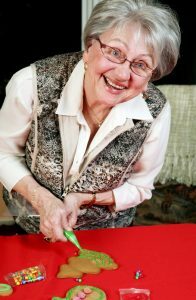 It can be difficult for seniors to do housework, especially if they have mobility issues or other physical limitations. Helping them around the house by cleaning, de-cluttering and picking up anything on the floor that could be a tripping hazard can ensure the senior’s home is safe. Don’t forget the outside of the home as well. Raking leaves, doing yard work and getting the outdoors ready for winter can be a huge help. Be a chauffeur. About one in five people over the age of 65 don’t drive. Offer to take your senior loved one to doctor appointments, dental check-ups and eye exams. And accompany them to them to some of their favorite social activities, volunteer opportunities and holiday events so they feel comfortable knowing there will be someone to safely transport them…and you can spend quality time with each other. Be Santa’s little elf. Help with setting up and decorating their Christmas tree. Make their home festive by decorating their main living space. Help wrap gifts and write and mail their holiday cards. You can even make holiday cookies together. The holidays can get busy, hectic and overwhelming for all of us. It’s important to remember what the holidays are all about – a season of peace, joy and giving. And remember the aging senior in your life. Just by spending time with them, you can help them have a happy holiday. What are some things you do around the holidays for the senior in your life? Comment here or join the conversation on our Facebook page.